The Salesforce CRM integrates AT&T Office@Hand with Salesforce.com to increase agent productivity and customer satisfaction. Log in as an administrator and follow these steps to set up CRM Call Center. Note: You have to be a Salesforce System Administrator to access this feature. Log on to your Salesforce.com instance as the System Administrator. 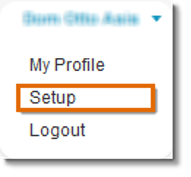 Click your name, and select Setup. Located on the left hand side, in the App Setup section, click Customize > Call Centers. Import the Call Center Definition File. Select the downloaded Call Center Definition file from AT&T Office@Hand, then click Import.